We regularly sell these stunning wall sculptures by Sunshine Coast artist Vaughan, so this image may differ slightly to the one we have in stock. Just contact us and we will send you an uptodate image. 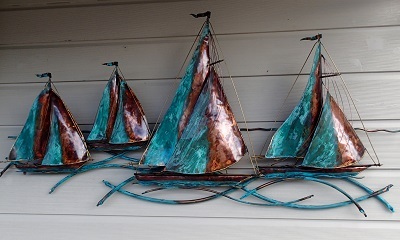 Oxidised copper 4-yacht race sculpture will suit any outdoor wall. Measures approx 1400 x 700.